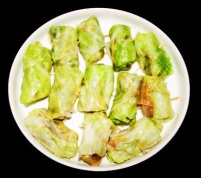 ﻿﻿﻿C﻿﻿﻿abbage roll (bandh gobi ki roll) is a dish consisting of cabbage leaves wrapped around in a variety of fillings. These cabbage rolls are the vegetarian version of meat stuffed cabbage rolls. Cabbage rolls can be shallow fried or deep fried and served as a snack or simmered them in the spicy gravy and served them as a main course. Cabbage rolls are an excellent dish to make all year around. They are very easy to make, so try them and experiment with different stuffing and I am sure they will be the center of attention in your next dinner party. 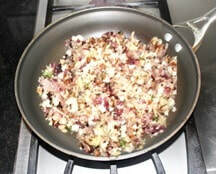 sauté them for 5 to 6 minutes or until they become light brown. ginger and mix with fried onions. the stove off, let the potatoes cool down. you have enough water to completely cover the cabbage, turn the heat to high. 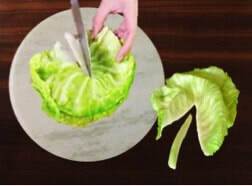 Periodically flip the head of cabbage so that it can cook on all the sides. they should be just tender enough to roll. along the back of the cabbage leaves to remove most of the cabbage leaf rib. This will make them easier to roll. 7. 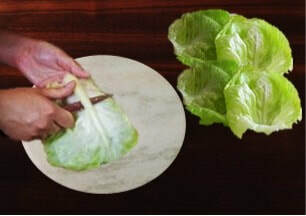 If the cabbage leave is too big then cut it big enough to make 2” to 2½ “roll. you will fold sleeping bag, then secure it with a toothpick, keep the roll aside. Repeat this process until you roll all the leaves. 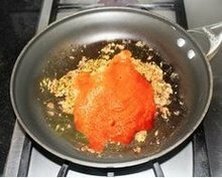 turmeric powder and mix with the fried onion and fry for few seconds. 7. Once all the water evaporated and you see the oil in the pan that means onion masala is done. 8. 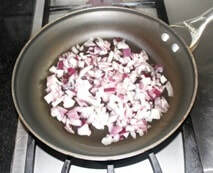 Add 3 cups of water and salt, mix with onion masala, cover the pan and cook for 10 minutes. stirring the gravy. Milk binds the gravy with onion masala together. of gravy. Turn the stove off. 1. Gravy becomes thicker as it cool down, add some water and boil it on low heat. 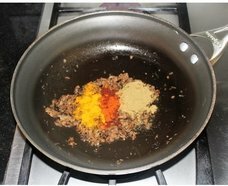 ﻿﻿﻿Please take the time to let me know what you think about my recipe. Your comments would be helpful to me to improve the recipe.